I talk a lot throughout my blogs and in my workshops about the importance of confidence to the process of attraction. Women want a man who knows what he wants, knows how to go after it, and feels absolutely at ease with himself. However, I want to approach the process of how to build confidence with women. And confidence is 100% a process. It is a way of thinking that has to be embedded over time, through repetition and the constant reinforcement of positive associations. What I mean is that you only need to start with one confident act. Think about it. It’s a chain reaction. You only need to have one warm, social conversation with a girl, and you’ve proven to yourself that it’s not so bad. So you carry that good energy into the next conversation with a girl and let’s say it doesn’t go so well. Do you take that negative association that comes with being turned away and go home? Of course not. Because the process of how to be confident with girls is the process of coming to accept that it is on you to lead an interaction, and when you do it the right way, and it works, that’s because you did it. If you had an impactful interaction with a woman once, you could do it again. 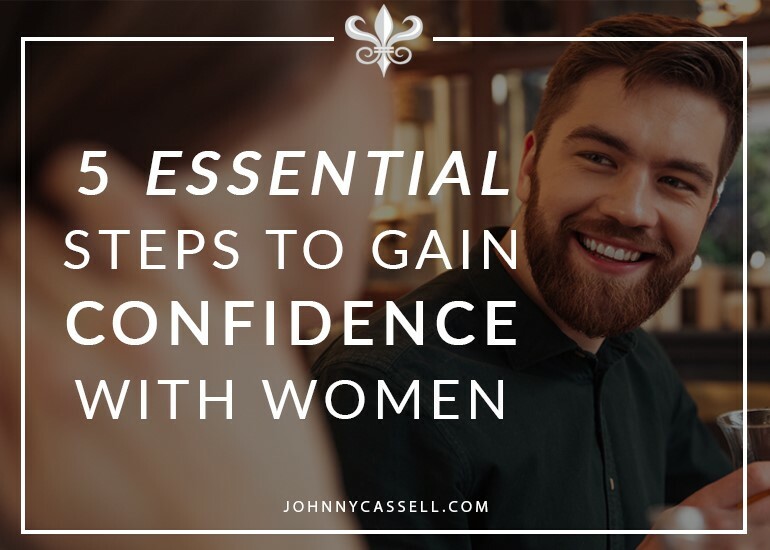 Here are the five core things you need to do to develop your confidence with women. Confidence with women comes from the confidence you have in your world. You have to know that your life is one in which you can safely say you have stock. Self-esteem comes from doing the best you can on your own terms, and always to push yourself by extending those terms. These are all huge parts of life, and the simple act of working at them will be enough to slowly build your confidence. This also means accepting your flaws. Don’t be complacent about them – as I mentioned, you should constantly be improving yourself – but don’t see yourself as more or less flawed than other people. Own your discrepancies and focus on building a better you. If these seem like daunting obstacles to tackle, don’t panic. No one is expecting you to turn all of this around in a day. There are still steps you can take to tackle how to build up the confidence to talk to a girl. As I mentioned earlier, confidence is built through positive references. They can be as minor as you want, as long as they’re a step beyond what you achieved yesterday. Make a to-do list and include your target as far as talking to women goes. One starting block I suggest to my clients is going to the shopping centre at lunchtime and asking five attractive women for directions. That’s all. No more. No less. I also recommend talking to a woman long enough to work out the colour of her eyes when you’re running these kinds of exercises. Not only will it encourage you to extend the conversation and get deeper into the mechanics of talking to a girl, but it also promotes strong, confident eye contact, which is a key attractor. Over time, and with many, many repetitions, you can ramp this up to obtaining phone numbers and setting little games for yourself. The confidence that you will get from the encounters themselves and from smashing your daily targets will be considerable and extremely valuable. Appearing pre-selected and talking to women as if you have nothing to gain from the conversation are key elements in how to be confident around girls. You can almost make a role play out of the situation to self-amuse. Pretend in the back of your mind that you have a partner, and you’re just making friendly chit-chat with girls at the bar. You’ll notice that the conversation is more fluid, and that you feel completely comfortable in the situation. This “I have a girlfriend” sensation is how it feels to be talking to every girl in the room. Because you have nothing to gain, right? You’re just talking to them to see if they fit your qualifications for an ideal partner. And in talking to so many girls, the stakes become that much lower in each individual conversation. The key to core confidence around women is constant practice. Even once you’re hitting your stride with opening women, you’ve still got to gain confidence at closing, and the physical side of romance. Mastery involves a multitude of failures and successes as a part of almost obsessive practice. You can read as many of these blog posts as you like, but you’re not going to learn much about how conversations with women work until you get out there and start approaching. Let’s say you approach 400 women in a month. 300 say no, 90 give you their phone number and 10 go home with you. The 10 successful closes are not the only takeaway here. You still get to keep the experience from the other 390. This will put you head and shoulders above other men in the room who’ve maybe made 10 approaches in the same month and got hold of one phone number. If you never speak to women, one approach can seem monumentally terrifying. If you continuously speak to women, one approach is simply routine. I cannot over-emphasise the importance of grooming. Even if you’re naturally good-looking, being unkempt and wearing shabby clothes is just going to look like you don’t care about yourself. It’s also going to feel terrible. If you’ve got dirty nails and wild hair, you’re going to feel uncomfortable about talking to women, and you’re hardly going to walk with the stride of a man in a three-piece tailored suit. Make sure you visit a barber every month, keep your wardrobe sharp and your nails clean and short. Keep your clothes washed and ironed, and don’t shy away from hair products. Looking the part can be a step towards feeling the part. If you could use bespoke one-on-one coaching to improve your confidence with women, take a look at my 7-Day Programme.